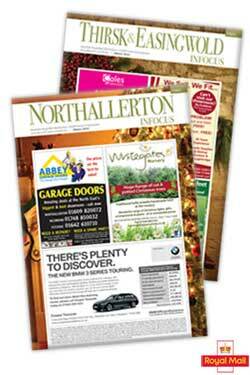 Distribution: 15,100 homes and businesses across Northallerton, Brompton, Romanby and surrounding areas. Distribution: 15,000 homes and businesses across Ripon, Masham and surrounding areas. Distribution: 16,600 homes and businesses across Thirsk, Easingwold and surrounding areas. Local Business Advertising across Northallerton and Thirsk & Easingwold. We are a publishing company committed to providing high quality, affordable Local Business Advertising for businesses and services across Northallerton, Thirsk & Easingwold and Ripon & Masham. We are proud to support local charities and frequently publish details of charity events and appeals. Why Choose InFocus for Local Business Advertising?